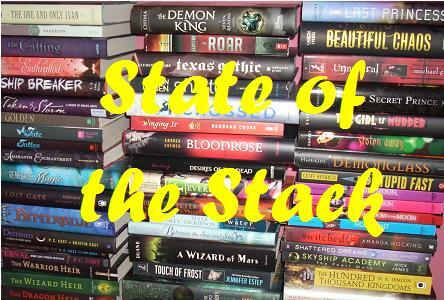 This is my monthly State of the Stack post. It is my way to keep track of my review books and to hopefully reduce the stack that I have waiting for me. I take a look at my review commitments on or near the first of the month. Please feel free to join in and let me know the state of your stack. Here is my Review Books Spreadsheet I list them in publication order and sort them by month. I can quickly see how many books I have for each date. Ideally, this keeps me from over-committing to review books. Check my spreadsheet to find out where I got each book. I also do this post because sometimes (frequently) review books sit on my stack for a while before I read and review them. I try to read and review books within two weeks of publication date. Sometimes I can't, though, if too many books are releasing on the same date or if the book arrives too near its publication date and my calendar is already full. I am very grateful to the authors and publishers who support my reading habit. These are listed in the order I read them. Links go to my reviews for all that have been posted already. Otherwise, the date the review is scheduled for is listed. These are listed in the order I received them. Links go to Amazon. Date published is listed in parentheses. Retiring and moving really messed up my reading plans. I am uncomfortable unless I am at least three weeks ahead on my blogs as far as reading and writing reviews for books from my review stack. I really like being able to change things up by reading something from my own massive TBR mountain. However, until I get my three week cushion again, I will be reading only review books. I should be able to rebuild my cushion in July unless something else comes up that keeps me from reading. Since I have two houses on the market and lots of little details to take care of with one of them, something may well come up.